Lessons Learned In the Field: “The Washboard Effect” - Zero/Six Consulting, LLC. Throughout the career of an experienced roof observer, you will inevitably run across roof deficiencies and installation errors. These ultimately lead to premature aging or premature roof failure. The roof is a costly component of the building envelope with its integrity being a large factor in the efficiency of the facility. Unlike many other building envelope components, roofs are susceptible to severe weathering, expansion, contraction, and abuse, which can result in additional roof system degradation. The origin of a roof ’s failure offers vital insight into refining installation practices that can prolong the life and performance of roof systems. With the latest technological advances in the roofing industry, we have come a long way from the 90-pound granulated roll roofing system utilized in historic building construction. Today manufacturers offer warranties upwards of 30 years and with the correct installation and proper roof asset maintenance program, this can easily be achieved. The procedures implemented during the roof system installation such as a manufacturer’s training and published guidelines are imperative tools designed to aid installers. During install, companies should ensure specifications, building codes, regulations, and ordinances are adhered to and followed by hiring a roof observer or third-party consultant. Recently, consultants and roof observers alike have observed an anomaly with torch applied modified asphalt membranes and hot mop applications that is being termed “the washboard effect”. In addition to the aesthetics of the roof system, building owners should be concerned about the effect it has on the longevity of the roof system. Over time, the prominent humps of the washboarding generate an increase in granule loss at their ridges. These increase pattern ridges of the cap sheet layer will lead to a reduction in the roof membranes ultraviolet (UV) resistance. 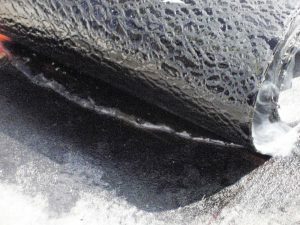 When the unprotected, modified asphalt is exposed to UV rays it will begin to rapidly degrade and alligator, ultimately leading to premature roof membrane failure. The occurrence of the washboard effect or ridge pattern anomaly is dependent on the quality of the roof membrane installer. The roofing industry needs to recognize the damaging effects on the longevity of a roof system created by an inexperienced installer. Educating the torch applicators thoroughly and providing adequate hands-on training is needed to ensure installers are informed on the proper roof application techniques and procedures. As the industry continues to evolve there will be ever-changing variables and challenges with roofing materials that the installer must adequately adjust to during the application process. We are a technology-driven society fueled by the latest products and trends. Installers must thoroughly understand the newest roofing products, materials, and procedures implemented by the manufacturers to stay ahead in the industry. It is the responsibility of the employers and manufacturers alike to provide continuing education workshops to keep installers on the cutting-edge of the roofing industry and ensure the future success of their roof systems. Much like the roofing industry, the construction science field will need to continue to evolve, exploring new methods of proper building envelope system applications and techniques so the industry can optimize the performance of the entire building envelope.